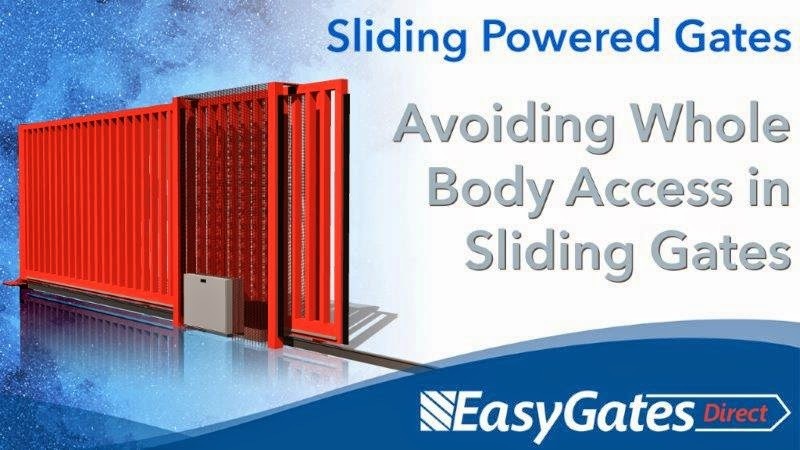 Easygates, Nationwide electric gate automation, access control and safety supplier, have produced a third 3D animation video to depict and re-enforce the core safety messages on sliding power gates. The video focusses on the information released by the DHF & HSE regarding gate safety legislation and standards, specifically the drawing-in risk on powered sliding gates. In late 2012 at a residential site in the UK a young child who was riding on a powered gate was carried into the gap between the gate leaf and the supporting pillar, becoming trapped and sustaining serious internal injuries which required surgery. The child was small enough to be carried through the gap between the vertical bars of the gate leaf and the support pillar. The safety edges fitted on the support pillars failed to prevent this as they were not best positioned to avoid the foreseeable risk from drawing-in and whole body access between the moving gate leaf and stationary parts. The current standards cover force, speed and recommendations for measurements of hardware, but the hazard of a whole body access is not currently recognised. A formal objection has already been made and the standard is currently being revised, it is anticipated that the revised standard will fully take this issue into account. Easygates have over 25 years’ experience in the industry and specialise in gate automation, safety solutions and access control. As ASO Safety Solutions UK competence partners, the company supplies a number of core safety products to the marketplace and is renowned for supplying quality, safety and technical services to a wide range of customers.